A relatively new kid on the block when it comes to programming languages and developed by Apple, Swift is designed for building apps for iOS and Mac OS devices. Developers love Swift because it makes coding fun and offers several modern features. It is a powerful programming language that can create lightning-fast software. You can use Swift to build apps for Apple TV, Apple Watch, iOS and Mac. The programming language is also very straightforward to learn. It is an open source framework supported by all iOS and Mac devices. It also has many compatibility modes through which other devices can also use this language. It is user-friendly, fast and uses modern technology. The only difference between these two is that you have to examine the app in web Sims in “React Native” whereas “Swift” can examine it internally. React Native is available for both Android and iOS, whereas Swift is only available for iOS. React Native also has a desktop version t known as – “REACT” which is available for both mac and Windows. Swift is only available for macOS devices and iOS devices. Unlike Swift, React Native automatically makes a landscape view better than that of iOS because it uses Flexbox (similar to that of CSS in HTML). Swift has some issues while we are using its functions but React Native has no issues when rendering. 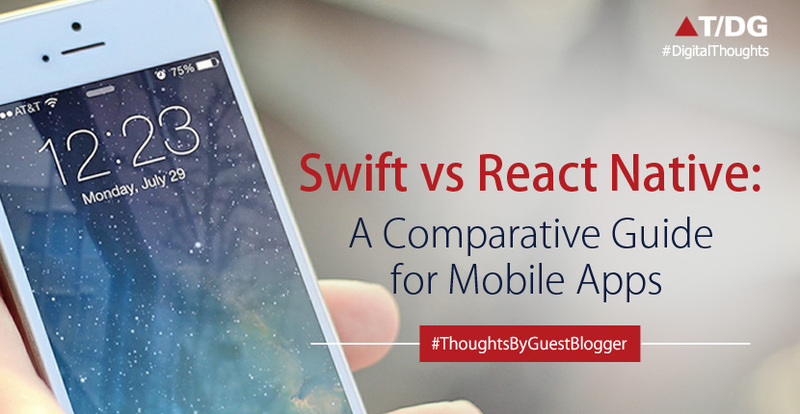 The major similarity between Swift and React Native is that both of them have the same UI as that of android and iOS. Now the time comes when we bring these apps face to face to reveal the truth about which one is the better choice for creating apps. For instance, we are taking the Apple’s Instruments app. We are testing the CPU, GPU and Memory usage. Apple Instruments app gives us access to plug-ins and tests the performance of any app that is connected to it. On an average, if we take this measurement, Swift React Native uses 17% of the CPU but Swift barely showcases any CPU usage. Moving on to GPU, both perform well but React Native wins this round because of more frames. Both of them are very powerful and there is no doubt about it. React Native uses single thread whereas other Native codes are free to use irrespective of the threads you are using. React Native is constantly updating and changing its user interface, which is very difficult for the developers who learn things at a relatively slow pace. It has complicated UI and the animations have no strong sides in the matter. It’s a very big language and learning it isn’t too hard. Needs constant rewriting of the application without any backward compatibility. It is unstable after every update that it gets and the developers can’t figure out the solutions for it. Because Swift is a new language, it has limited third party application access and no backwards compatibility. Apple codex is better than this but you compulsory need a mac for that. You can create apps for both Android and iOS without any difficulty. React Native uses Flexbox which is very useful when you are trying to create an app with landscape mode. The speed of Swift is very reliable and also you don’t have to use much of your CPU and it uses a bit of GPU. If you have to create a much complicated app for iOS, then this is the perfect programming languages for you. Swift also supports dynamic libraries which enables huge coding functions. Both the languages are good for developing mobile apps and the resulting apps are similar in physical performance. Both have their own share of disadvantages and advantages. On CPU, Swift wins in terms of performance and when it comes to GPU, React Native wins. React Native also emerges the winner when it comes to memory usage. So, clearly if you prefer both iOS and Android platforms, React Native is the better of the two. However, if you only prefer iOS, then you can go for Swift.